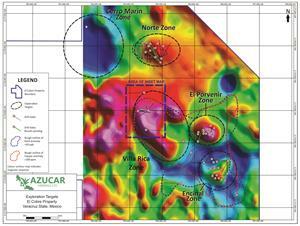 The four copper-gold porphyry targets currently known within the El Cobre Project, Encinal, El Porvenir, Norte and Villa Rica are defined by distinct Cu-Au soil anomalies, discrete, positive magnetic features and a large IP chargeability anomaly. The largest target area is the Villa Rica Zone and apart from preliminary work in 2017 has never been drill tested in past programs. The targets’ results to date are summarised below and a map is attached. 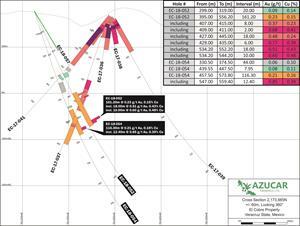 Azucar is an exploration company with a mandate to thoroughly explore the El Cobre project in Veracruz, Mexico, an ~7,000 Ha property which covers multiple gold-rich porphyry targets, as demonstrated by recent drilling. 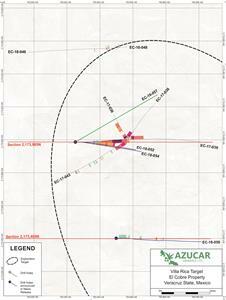 Azucar is permitted and funded for active drill campaigns through 2019. 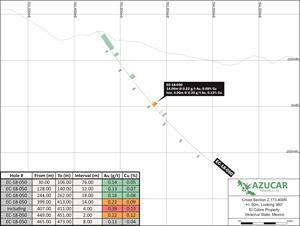 Azucar holds a 100% interest in the El Cobre project, subject to net smelter returns (“NSR”) royalty interests, assuming production from the property exceeds 10,001 tonnes per day of ore, totaling 2.25% which can be reduced to 2.0% though the payment of US$3.0 million.